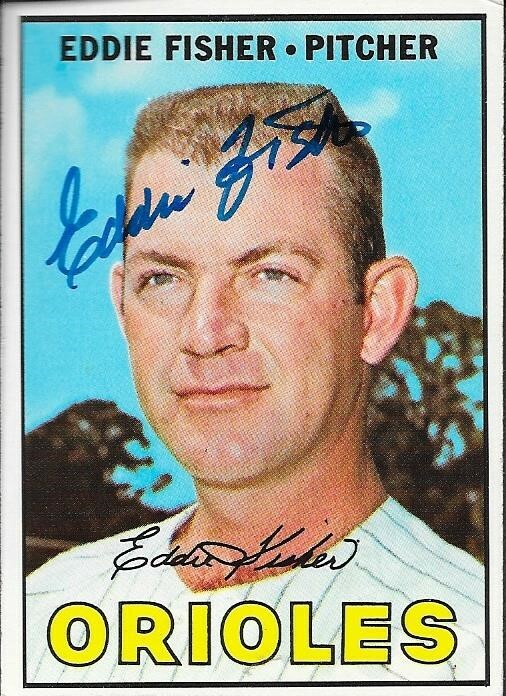 I got this TTM success from former Oriole Eddie Fisher complete with a card from the player, himself. I must have said something in my letter to him that I was a huge Orioles fan, and he included this 1967 Topps of him as an Oriole. This was really cool, because I have very few extra 1967 Topps as it is, and to add one of an Oriole, well, that was nice. 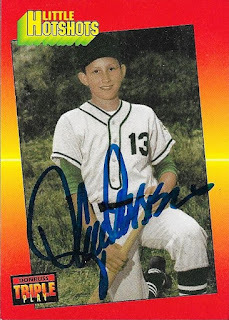 This 1969 Topps was the one I actually sent out, and it also came back signed. 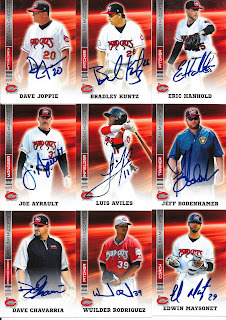 I don't have many extras from this set, either, since I am currently working on completing the set. The set has stalled out, but will get completed sometime soon. Fisher (b. 1936) played in the majors from 1959 to 1973 for the Giants, White Sox, Orioles, Indians, Angels, and Cardinals. 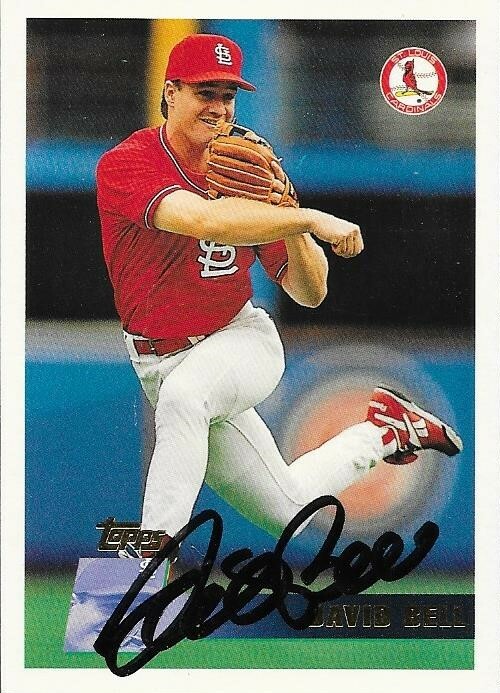 He had a career record of 85-70 with an ERA of 3.41 and 812 strike outs. 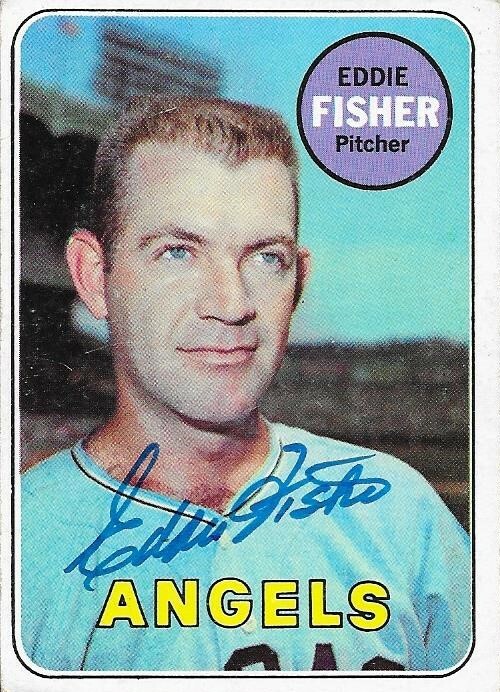 He was an All Star in 1965, and also finished 4th in the AL MVP voting that season. He appeared on the 1979 Hall of Fame ballot, but did not receive any votes. 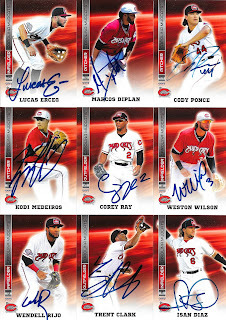 I mailed to August 7 and got the cards back on August 16, for a 9-day TAT. This was a TTM success that got me pretty excited when it came in. I had a few cool cards of former Rangers manager, Ron Washington, and they all came back looking great. This 1990 CMC AAA was one of the minor league cards that came out of a show box from Mom's attic. I'm glad to be able to use some of those obscure minor league cards, and this one of Washington looked really cool. I had to add a 1987 Topps to the album, and I don't have many 1989 Upper Deck for whatever reason. Both of them turned out really nice, as well. Washington (b. 1952) played in the majors in 1977, then from 1981 to 1989 for the Dodgers, Twins, Orioles, Indians and Astros. 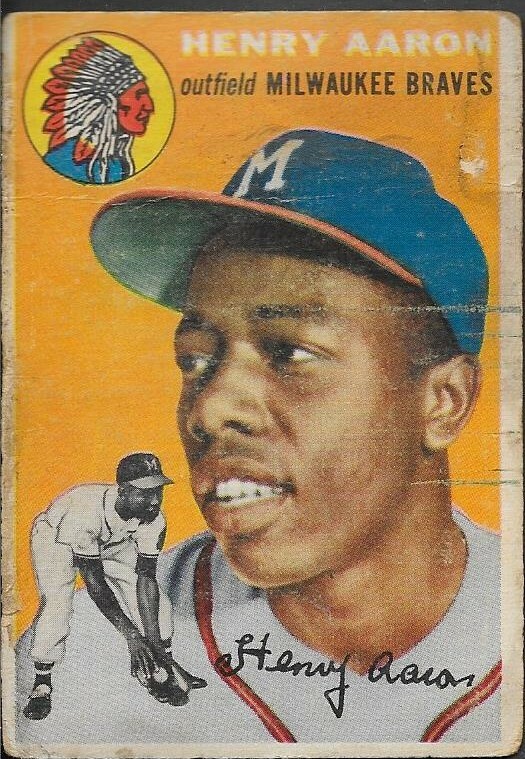 He had 414 hits, 20 home runs and a .261 batting average. Washington managed the Rangers from 2007 to 2014 to a record of 664-611 (.521%). His Rangers won the AL Pennant in 2010 and 2011; losing in 2010 in 5 games, and losing in 2011 in 7 games. 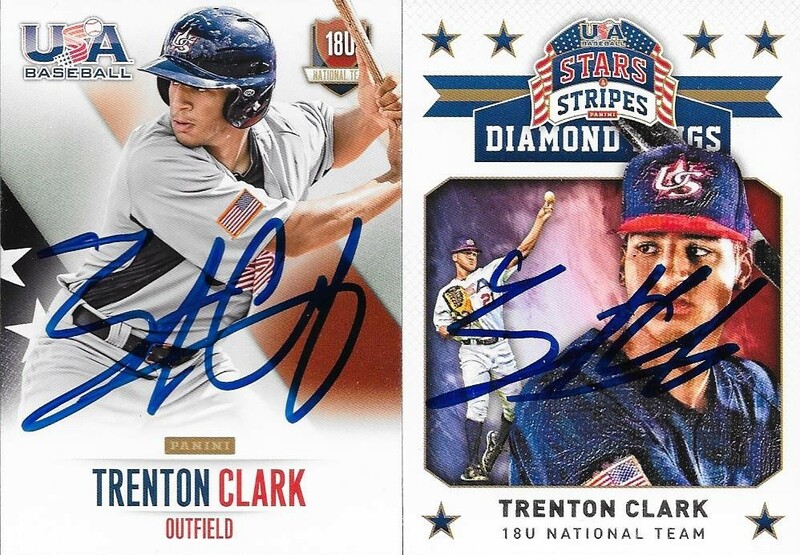 I mailed to Washington on June 12 and got the cards back on August 12, for a 61-day TAT. I sent via the Braves at SunTrust Park. 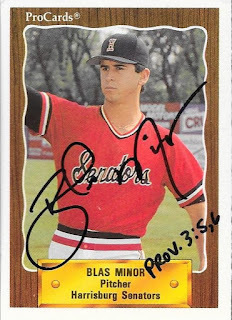 This TTM success from Blas Minor is definitely highlighted by the above 1995 Fleer. The color combination on the card really looks cool, and his choice of black Sharpie fits in perfectly. This set gets a lot of flak, but I enjoy its weirdness. I keep thinking about picking up a random box of 90s stuff, and this product might be a fun one to grab. I added some nice mid-90s cards with this success as well. The 1993 Upper Deck turned out really nice, and I also like the 1994 Donruss. This 1990 ProCards turned out really nice, too. This came out of a shoebox of cards that Mom gave me a while back, so it was nice to add it to the album. It is a really cool design, and Minor's signature pops on it for sure. Minor (b. 1966) played in the majors from 1992 to 1997 for the Pirates, Mets, Mariners and Astros. 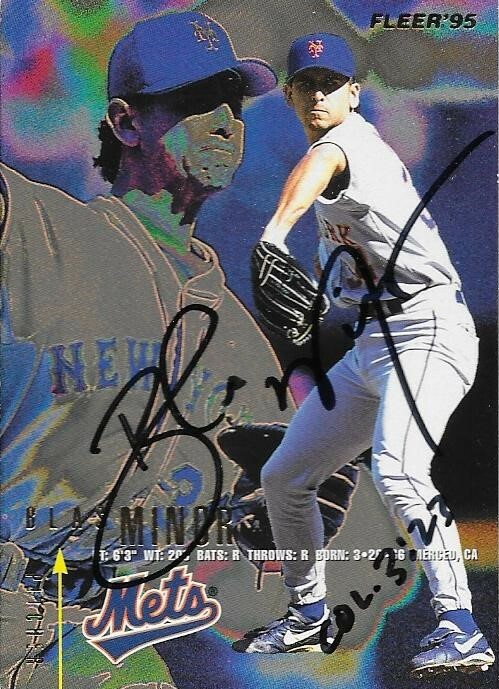 He had a career record of 13-10 with 184 strike outs and a 4.40 ERA. I mailed to Minor on May 4 and got the cards back on August 12, for a 100-day TAT. These cards that I got TTM from Reggie Jefferson didn't turn out as well as a lot of my other TTMs, and I also didn't get back all of the cards I sent, but this was still a success. I did get a few Topps cards for the autograph project, and 1994 is very low on my tally, so I was glad to get one in. Jefferson (b. 1968) played in the majors from 1991 to 1999 for the Reds, Indians, Mariners and Red Sox. 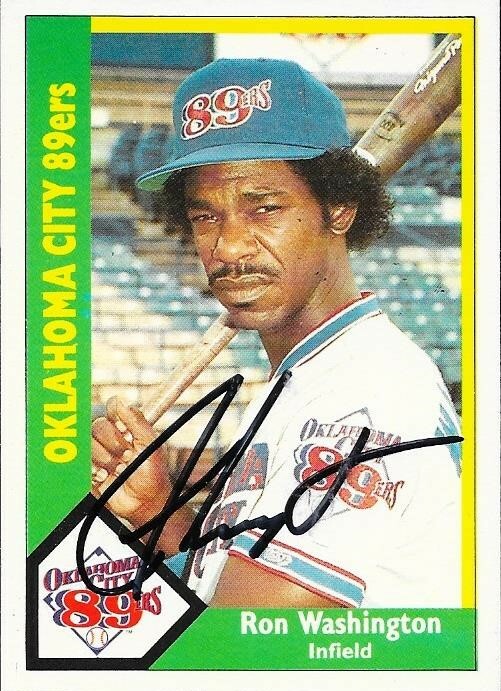 He had 637 hits, 72 home runs and a .300 batting average. 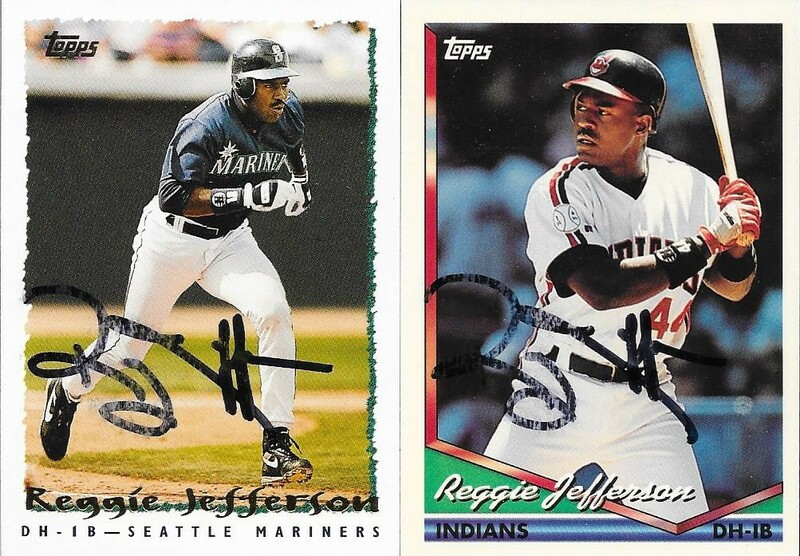 I mailed to Jefferson on May 10 and got the cards back on August 10, for a 92-day TAT. It has been a long Wood Ducks season, but as the calendar winds down, I have experienced the last home series of the 2017 Wood Ducks season. This series was the only time that the Lynchburg Hillcats would visit Kinston, and I did my best to maximize my efforts while graphing. I think by the end of the series, some of the players were tired of seeing us, but we were pleasant and friendly with them, nonetheless. I took 50/50s from my friend, Gerard, and also picked up some cards to send out to my friend, Parker and his brother, since they are big Indians fans. 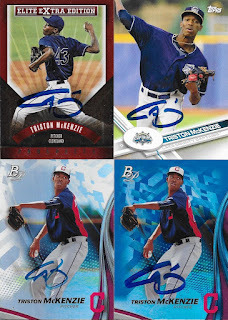 I had 4 of the above 2017 National Exclusive Bowman Chrome Triston McKenzie, and got them all done. Parker, Hayden, my son Chris and I all will take one. McKenzie was one of the nicest non-Wood Ducks that we met this season. He graciously signed everything we had. I talked with him each time he signed across the three days. He pitched the first game of the series, and did really well. The kid has a ton of talent, and I will enjoy seeing him progress through his career. 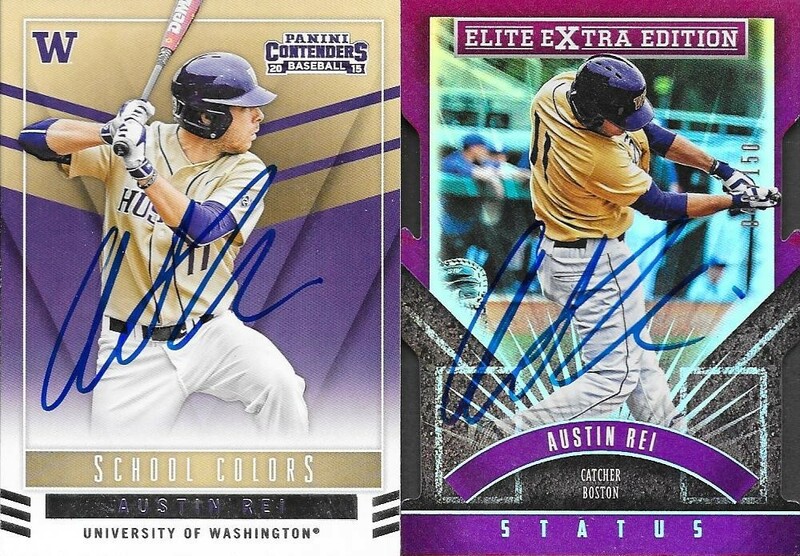 The purple Asia exclusive parallel isn't numbered. I had a lot of different stuff of McKenzie. I really hope he of all people wasn't annoyed with us. 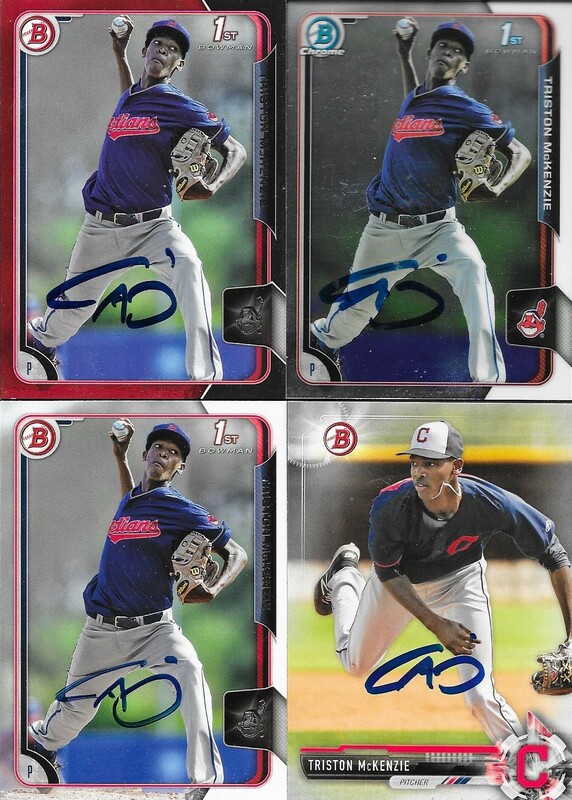 I knew we wouldn't see him again, as I have a feeling that he will rise very quickly through the Cleveland system. Ka'Ai Tom was also really nice. He helped me with the pronunciation of his name (pronounced Kuh-eye) and explained that the apostrophe in Hawaiian acts as a pause. He was really cool, and I appreciated him signing for us and helping with my butchering of his name. The purple Bowman Chrome refractor is numbered 147/250. 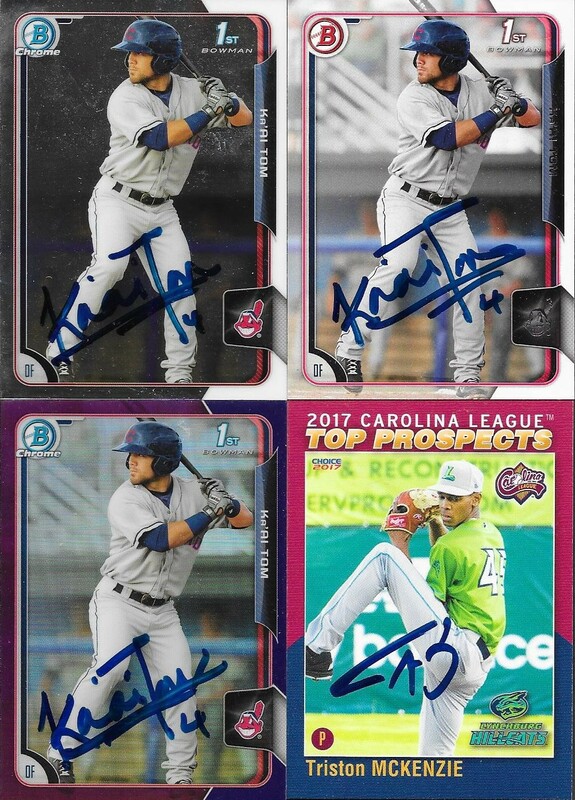 Between McKenzie and Argenis Angulo, I got two more cards signed from my 2017 Carolina League Top Prospects set. 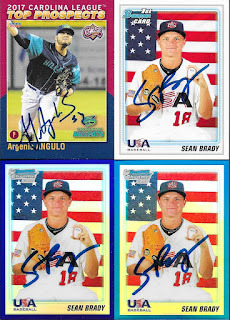 I also added another 2010 Bowman USA card in that of Sean Brady. He is almost unrecognizable with a full beard now. Of course, he was 16 in this photo and that was a while ago. 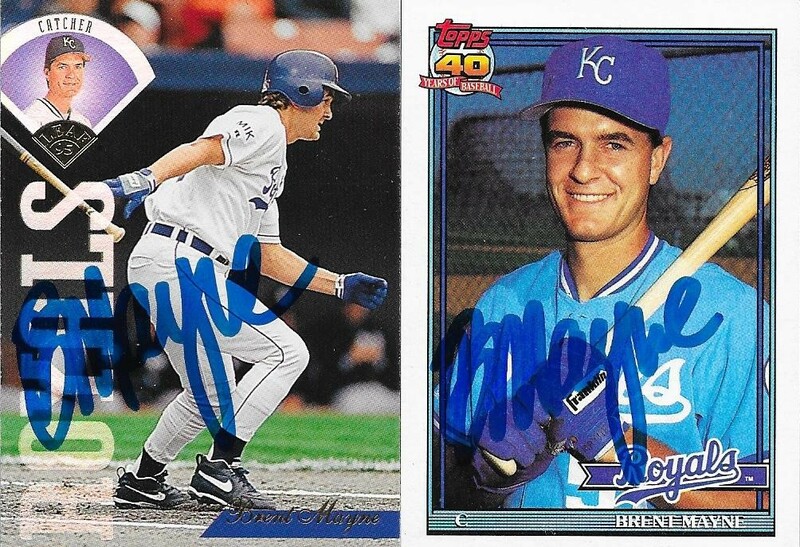 The purple parallel (left) is not numbered and the blue (right) is numbered 67/199. I got to say "Go O's" a few times to former Oriole, Kyle Hudson. 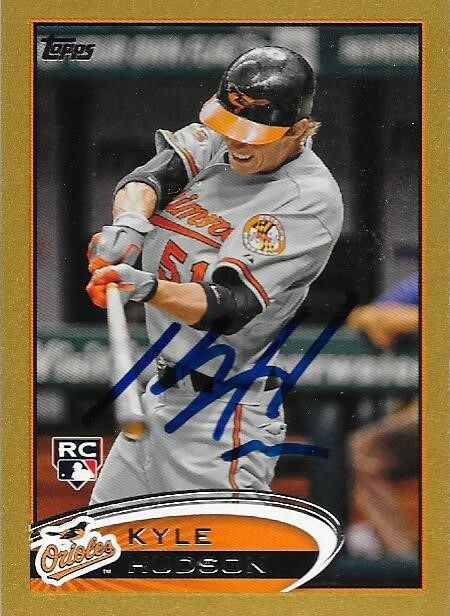 He also chatted with Chris and I about playing for Buck Showalter, and alongside Nolan Reimold. Of course, he had great things to say about both guys. 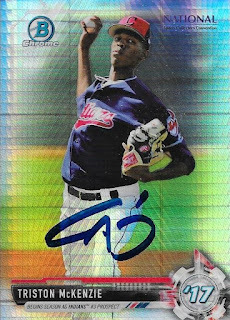 This Hudson 2012 Topps Mini gold parallel is numbered 21/61. I had picked up a few cards for this series off of COMC. One of which was this Bowman Heritage card of Kevin Howard. I really like how this card turned out. 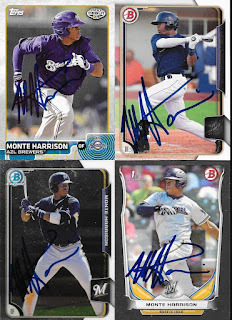 I added a 2012 Topps from Hudson to my Topps Autograph Project. 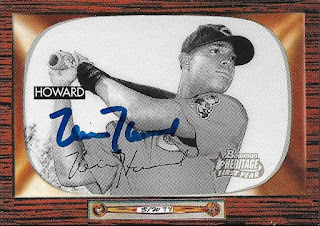 The 2004 Howard is actually a Topps Rookies and Traded, so it won't count toward the 2004 base set. 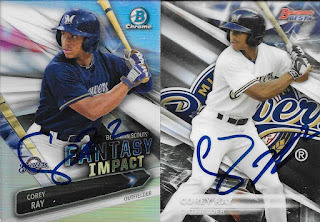 The 2004 Bowman is actually a refractor, but the scan didn't pick it up. 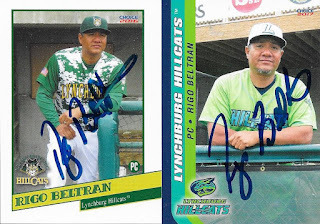 Rigo Beltran was a really cool signer. I had to walk across the stadium to the visiting bullpen to get him, but when I got there, I ended up chatting with him for about 15 minutes. We talked about McKenzie's talent and then about former Frederick Key, Austin Hays, who is tearing it up in AA Bowie now. Hearing Beltran's analysis of Hays was really cool, and I could talk to the guy about baseball all day long if I could. I really hope to run into him again, as he was such a nice guy. I did have a few Wood Ducks left over. 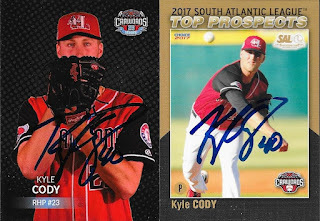 I almost missed recent call-up, Kyle Cody. 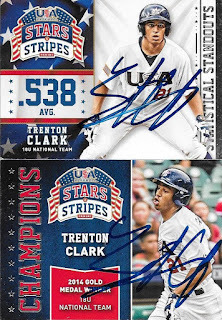 I had him in my 2017 Hickory set and also my 2017 South Atlantic League set. 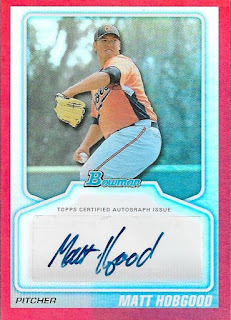 He has been really good so far for the Wood Ducks and I don't think he will be in this league for long. 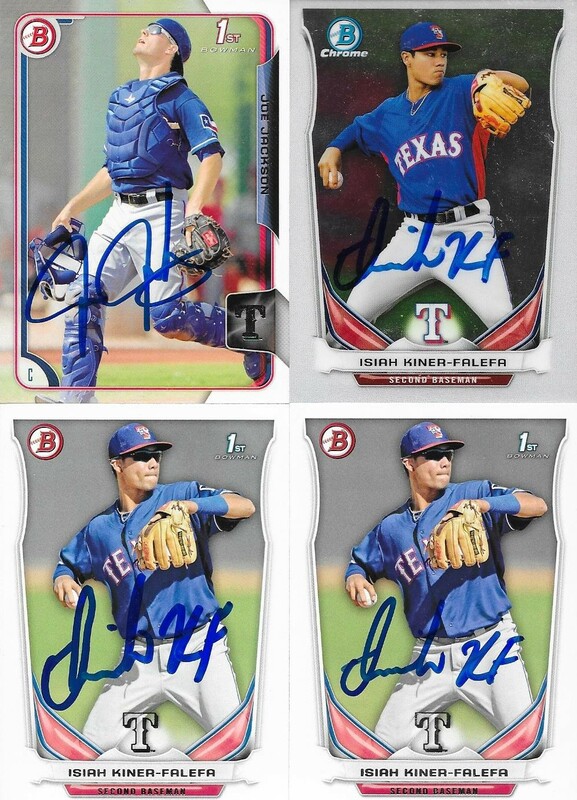 I imagine he will start next year for AA Frisco. 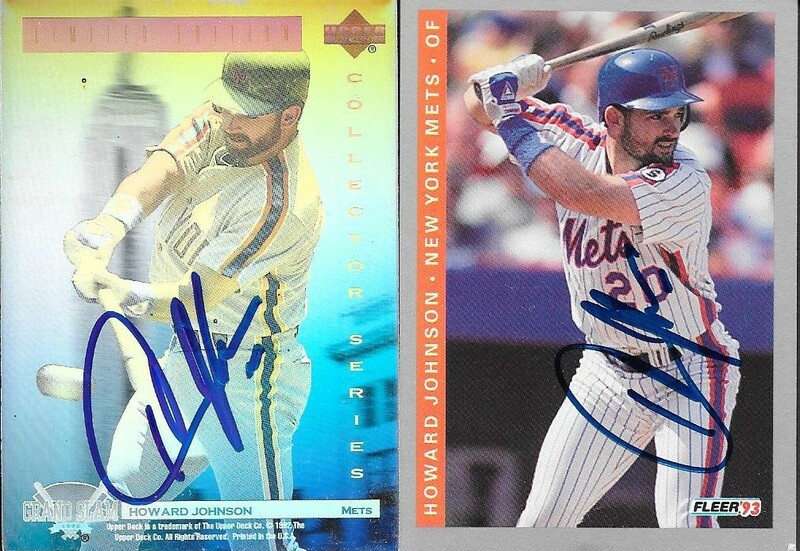 I finished up all of the 50/50s I had of Howard Johnson for my friend, Gerard. I also knocked out a bunch of the ones I had remaining in my snap case. I really appreciate how Howard has stopped and signed for us this season. 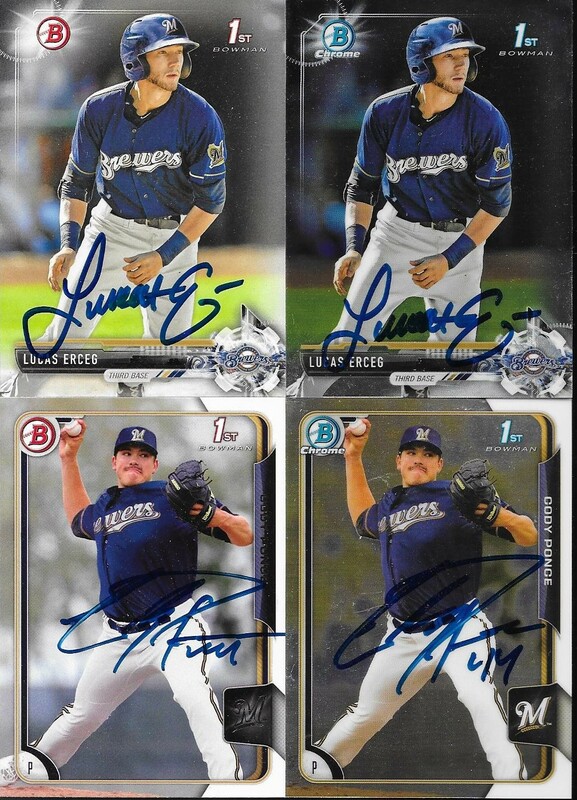 Johnson was a star when I first started watching baseball, so to have some conversations with him this season, and to get his autograph several times has really been awesome. I plan on cutting back on getting him next season, as I really don't think there are any cards left of his that I don't have in my album. I might possibly go to the Buies Creek game against the Wood Ducks next Saturday and graph one final time this season. I am leaning heavily toward it, especially since Brett Martin is starting. If I don't go, however, I will end today's graphing having had a grea time this season. I enjoyed doing the 50/50s for my friends and helping others work on auto sets. By my math, between the Orioles-Tides exhibition game to today's final home game, I have gotten at least 894 baseball cards signed. I added up all of the numbers and was amazed by how many I had gotten done. I, of course, had a lot of help and need to thank my wife, my son, my nephew, my brother Andy, Nikolas, Logan, Angela, Andrew, Max and Gavynn for helping me out this season. It's not often when someone messages me out of the blue saying "I think you're a good guy and I'd like to be friends", but that is essentially how the first conversation between my friend Brayden and I went. He had messaged something to that effect to me, then we went on to make a deal later for an Adrian Beltre signed baseball. Since then, I have talked to Brayden daily. He's a huge Yoan Moncada fan. Not only because Moncada is a great prospect and all, but because they have an actual friendship. I think that is pretty cool. 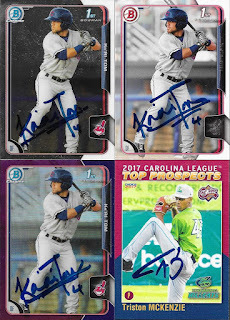 Brayden lives in Texas, and his home MiLB team is the Frisco RoughRiders, so he is able to catch some Wood Ducks that have been promoted out of High A.
Brayden took care of a few 50/50s for me, and also included some nice Orioles cards and a couple other IP autos that he was able to get recently. 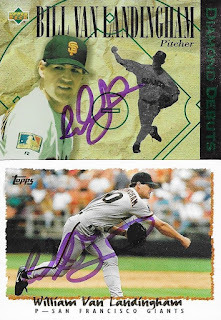 I had sent Brayden the last remaining Mike O'Neill card that I had, along with another that I had found in a dime box earlier this year at a show. He took care of those for me, even though I was completely ok if he had kept them. 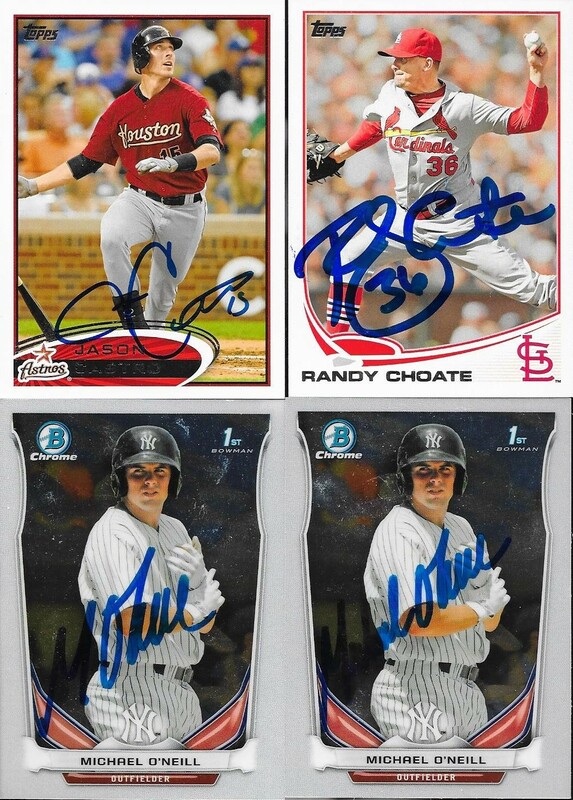 He also added the above Jason Castro and Randy Choate cards. Brayden got a few Isiah Kiner-Falefa cards done for me, and added the 2015 Bowman Joe Jackson. Jackson is cool because he is a distant nephew of Shoeless Joe Jackson. 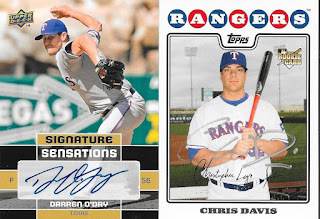 Finally, Brayden included this nice autograph of Darren O'Day and this rookie card of Chris Davis. He didn't have to add the extras, but it was really cool of him to do so. Brayden is a great guy, and I am really happy that he saw to it to message me that day. I only saw the Salem Red Sox once this season, and that was at Five County Stadium in Zebulon. 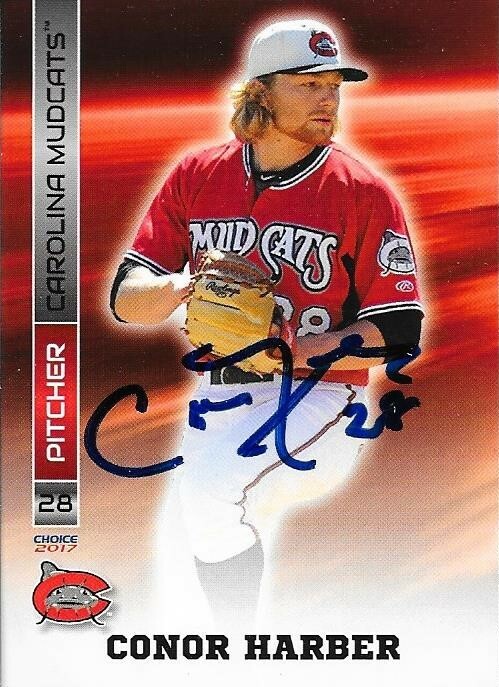 It was the July 4 game against the Mudcats, and I didn't do very well at all trying to graph the Red Sox. So, I sent what I had left out to my good friend, Dylan, to complete. 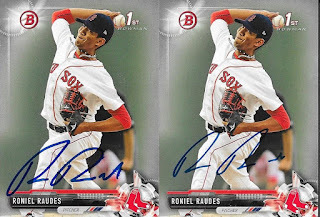 His home team is the Red Sox, and he worked on my cards through the rest of the season. The above 2010 Bowman gold refractor of Marc Brakeman was the one card that I wanted the most, and Dylan came through for me. This card is numbered 50/50, which is kind of ironic (don't you think?). 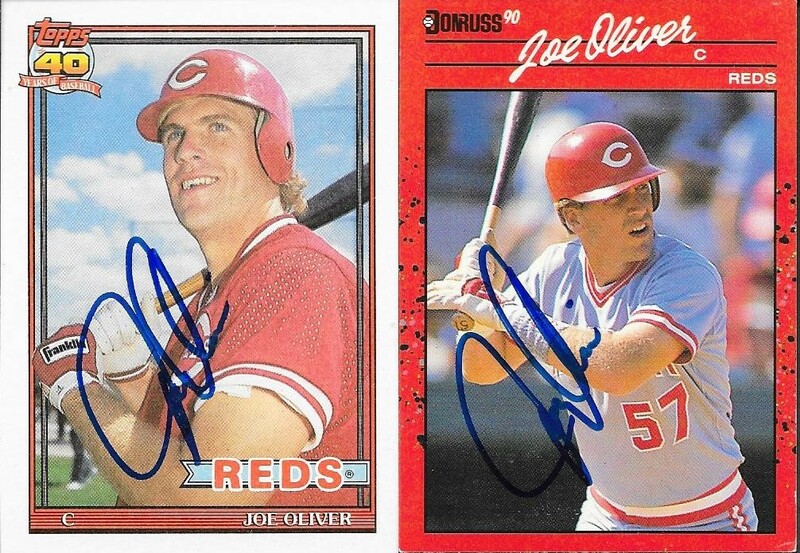 Dylan hooked me up with a couple Joe Oliver cards. 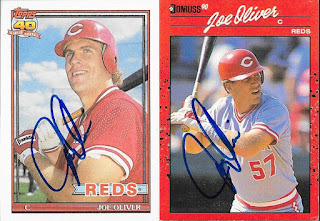 Oliver was one of the few guys who would sign for me at the July 4 game. Paul Abbott, on the other hand, would not. Oh well. 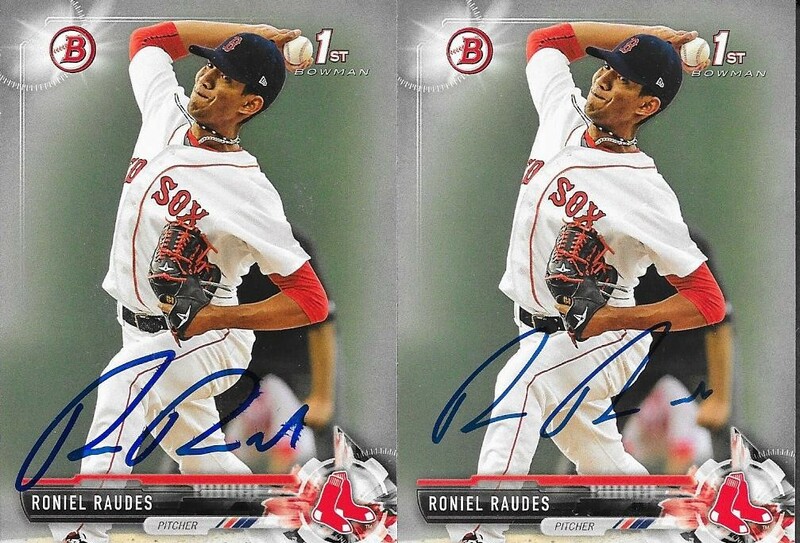 I got these two Roniel Raudes cards back from Dylan. 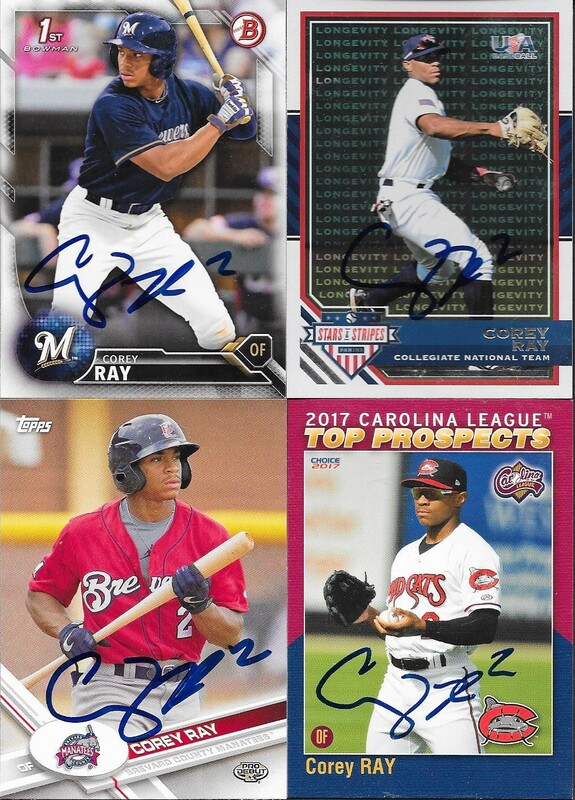 I have gotten quite a few 2017 Bowman cards signed. 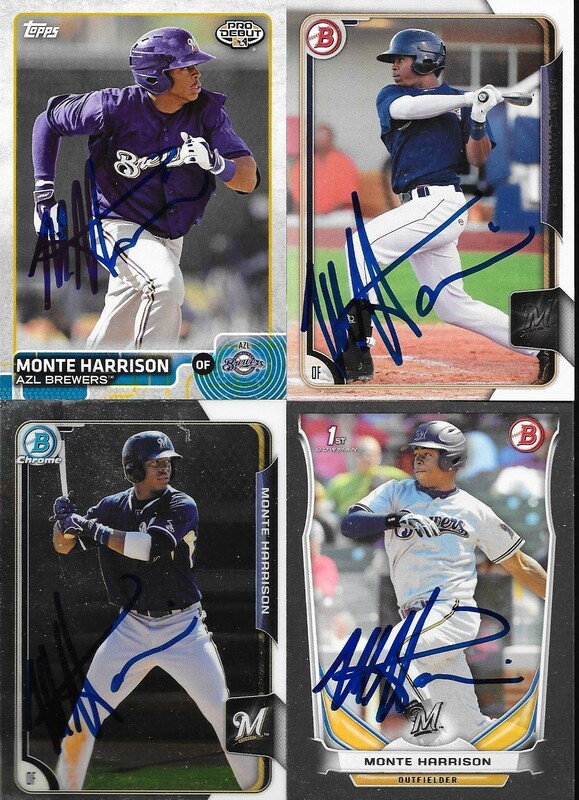 Not that I am working on the set or anything, but they are nice cards to get signed. 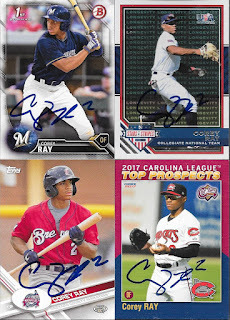 I had picked up a bunch of cards from my LCS for the Salem guys, and was disappointed that I couldn't get any of them done. Dylan made it a little better for me, especially with these two Austin Rei cards. Both of them turned out great. 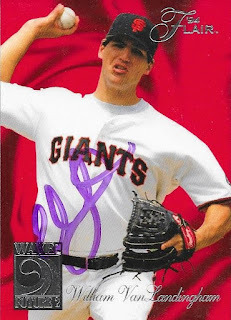 Dylan kept one of my Josh Ockmey cards, which was fine by me. I was happy to get this Pro Debut back from him, though. 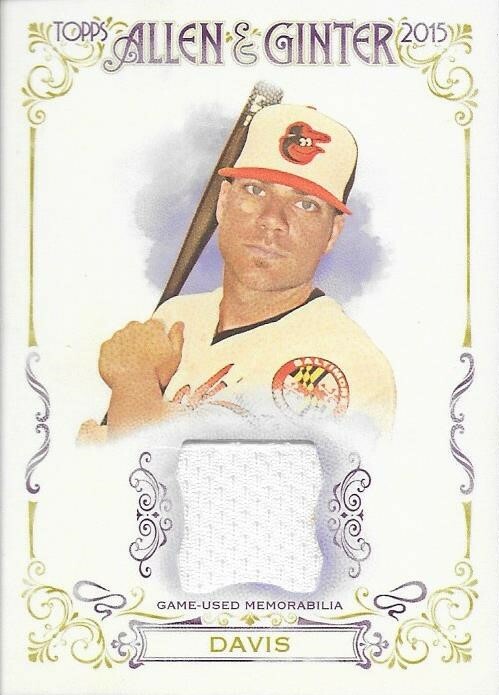 Finally, Dylan included this 2015 Ginter Chris Davis relic for my PC. I really appreciated that he thought well enough of me to add extras. Thanks so much for the 50/50, Dylan! I hope we can do more next season. 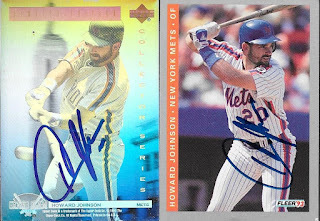 This is a TTM request that I held onto for quite a while, because I had the above 1996 Collectors Choice gold signature somewhere, but could not locate it. 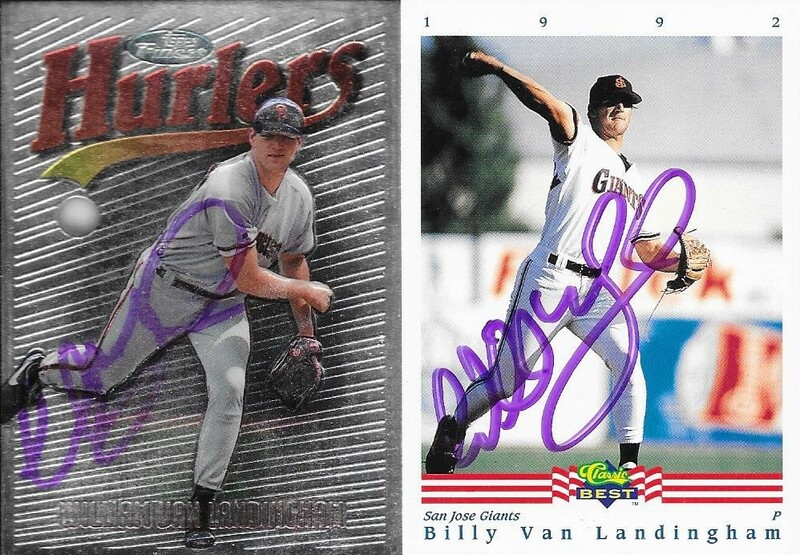 Finally, I found the card in one of my boxes and sent the request out to William Van Landingham. 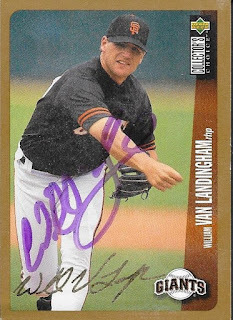 Van Landingham signed everything with a purple Sharpie, which turned out pretty nice. It is a different choice, but I'm ok with it. 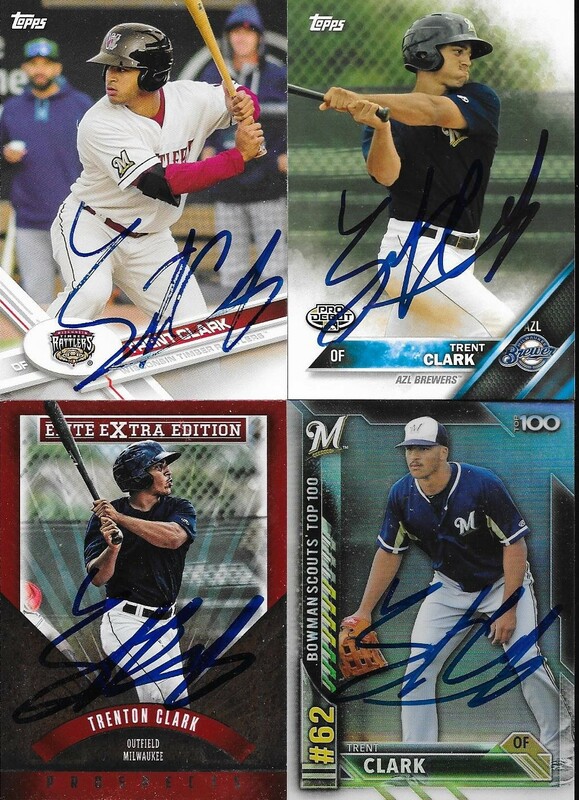 I had a bunch of his cards to choose from, which made it tough to narrow ir down to just a few to send out. This 1994 Flair Wave of the Future might be the best looking one of them all, though. I just think it looks really nice with the red background. Van Landingham (b. 1970) played in the majors from 1994 to 1997 for the Giants. 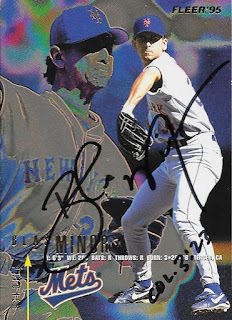 He had a career record of 27-26 with a 4.54 ERA and 300 strike outs. 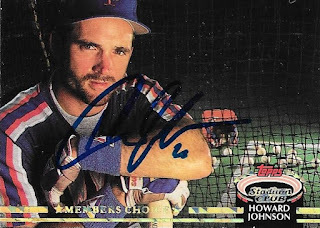 He finished 7th in the 1994 NL Rookie of the Year voting. 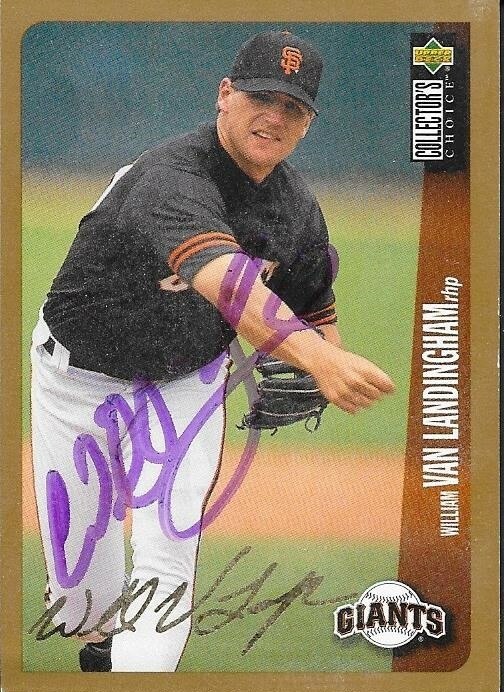 I mailed to Van Landingham on July 14 and got the cards back on August 10, for a 27-day TAT. It seems that every year, I have one huge pickup from the National, and this year was no different. I didn't stop at the 1955 Bowmans that I grabbed for the collection. I had in my mind that if I could find a decent Hank Aaron rookie at a reasonable price, I would leave the show with one. I priced Aarons the last few days of the show, and used my memo feature on my phone to log the table numbers where I saw each card and at what price. I actually did this for several of the cards I ended up buying, and it made the chore of remembering where the heck I saw a card so much easier to manage. I had also bought portable batteries for my phone in case I ran my charge down. I was really smart about my phone usage on this trip, and it paid off that Sunday when I got a nice deal on this Aaron. Yeah, the card isn't in mint condition, but neither are my Banks or Kaline rookies. I could make a nice run at the 1954 set, now. 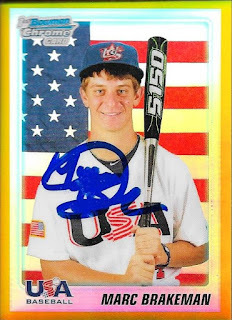 I might take a look at the bulk cards that I have and see if I can manage it, but in the meantime, I am just going to sit back and enjoy the fact that I finally have this awesome rookie in my collection. My plan is to catch up on some of my 2017 National Card Show pickups once I get a little free time in the evenings. Lately, I have been really busy, and haven't had time to sit down and scan more of the cards that I got at the show. In the meantime, I am going to keep trying to get ahead on my TTMs, but even that has fallen behind. I'll get there when I get there, I guess. Luckily, I have been getting in some successes, even though I haven't sent out much lately. I did get another book of stamps, so I can try to get some stuff in the mail soon. 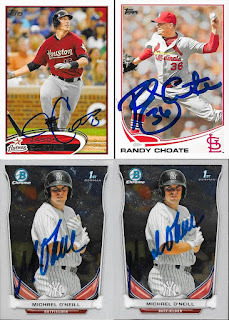 I got these cards in from JR House recently, the best one being the above 2001 Bowman's Best. I got this out of a box at my LCS, and it turned out nicely. He used an old sharpie for the signature, but in the end, it turned out ok. 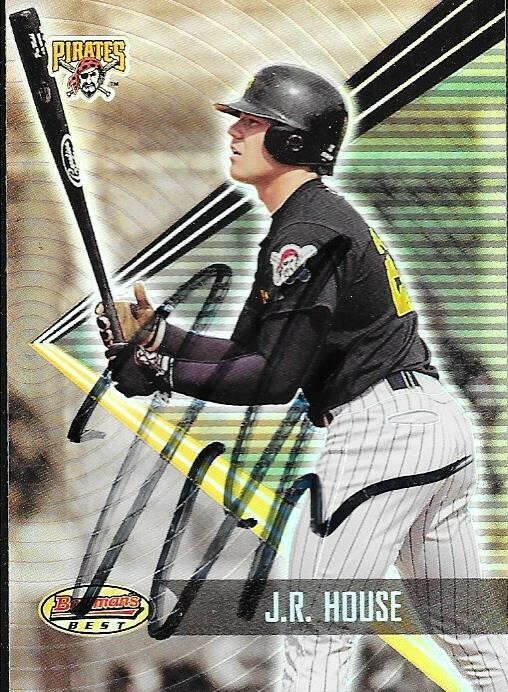 I also got this 2001 Topps signed by House. I doubt I will pursue the other two guys, but you never know. I may give it a shot down the road. House (b. 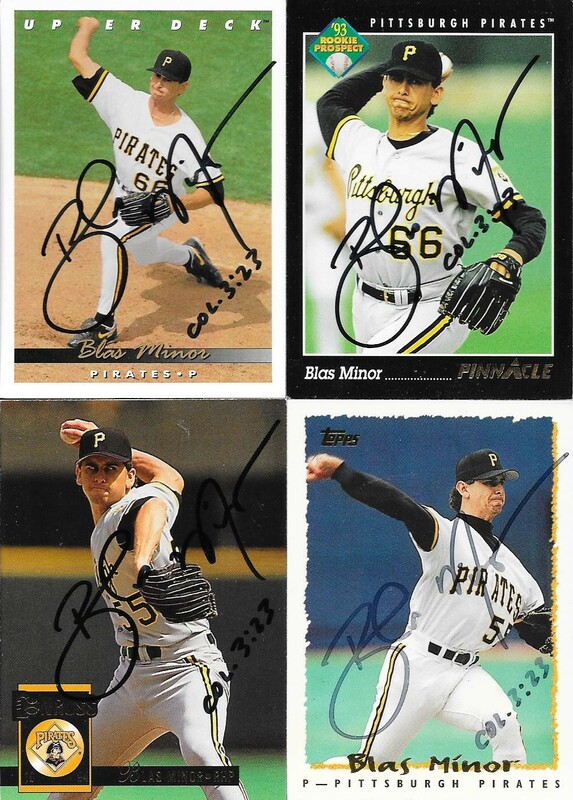 1979) played in the majors in 2003 to 2004 and 2006 to 2008 for the Pirates, Astros and Orioles. He had 10 hits, 3 home runs and a .202 batting average in his career. I completely forgot he was an Oriole. His 3 homers came while he was an Oriole in 2007. 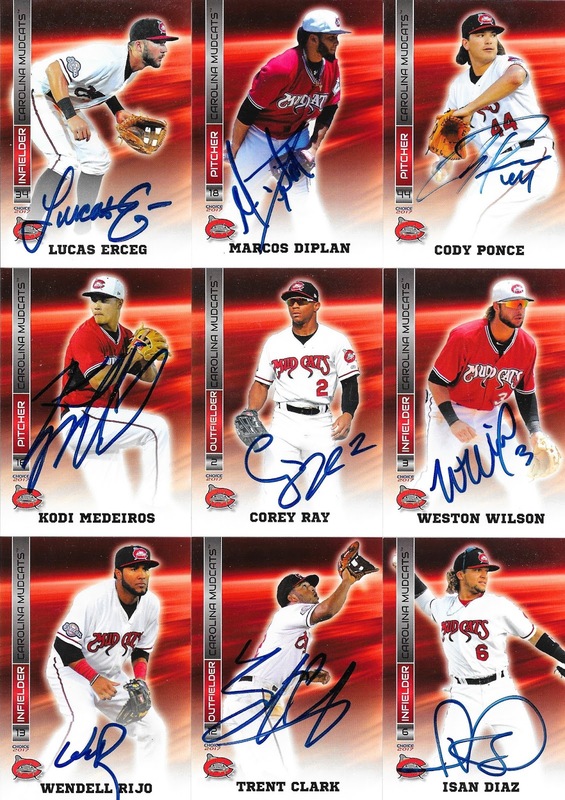 I mailed to House on June 12 and got the cards back on August 5, for a 54-day TAT. I finally got a TTM return from former catcher, Lance Parrish. It took me over a year and a half, and two attempts, but I got some signed cards back. I liked this 1992 Triple Play Little Hotshots card, as it was the first of these that I have added to my album. I also added some nice Topps cards, including another 1987 for the album. I also was glad to get a 1989 Topps, as it was one of the first ever baseball cards that I had. Parrish (b. 1956) played in the majors from 1977 to 1995 for the Tigers, Phillies, Angels, Mariners, Indians, Pirates and Blue Jays. He had 1,782 hits, 324 home runs and a .252 batting average. He won the World Series with the Tigers in 1984. He was an 8-time All Star and his best finish for the MVP award was 9th (1983). 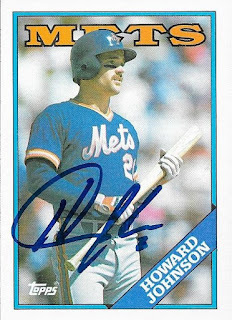 He was a Silver Slugger Award winner in 1980, 1982, 1983, 1984, 1986 and 1990. He won the Gold Glove Award in 1983, 1984 and 1985. Parrish appeared on the Hall of Fame ballot in 2001 and received only 1.7% of the vote. I originally mailed to Parrish on February 18, 2016, but never got those cards back. 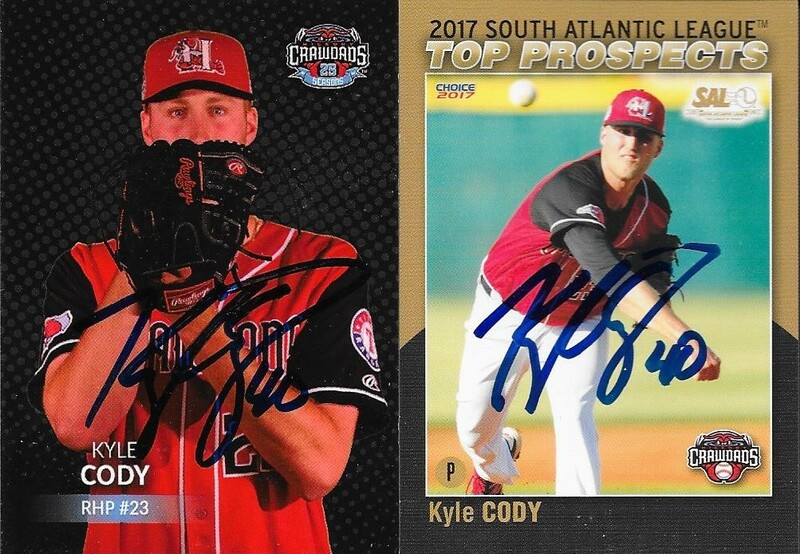 I mailed to him again on June 10 of this year via the Erie SeaWolves, and got the cards back on August 4, for a 55-day TAT. Here is a TTM success that took a while to come in. I like the cards that I got back, even though I didn't get everything back that I had sent out. I now have a couple signed 1992 Studio in my album. Studio was always a nice product to open, and now they are really nice cards to get signed. I also liked the 1995 Leaf set. 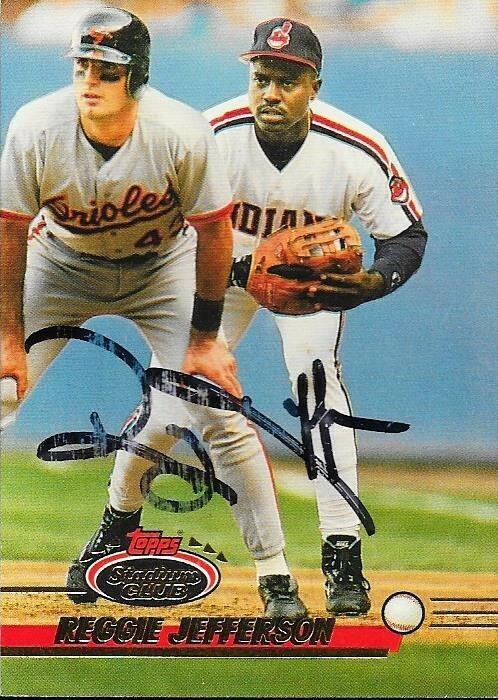 I opened a ton of it to try to get the Cal Ripken Statistical Standouts, and now I am able to get a few of the cards from that set signed and added to my album. It's nice to get some of them out of my boxes and into my albums (and onto my blog). I don't have a lot of bulk 1991 Topps for some odd reason. I have come across several cheap boxes of it, but for whatever reason, the bulk stuff left over always disappears or ends up with someone else. I think the last box I busted was during pack wars with Andrew, and I think his little brother ended up with a lot of the base. Mayne (b. 1968) played in the majors from 1990 to 2004 for the Royals, Mets, A's Giants, Rockies, Diamondbacks and Dodgers. 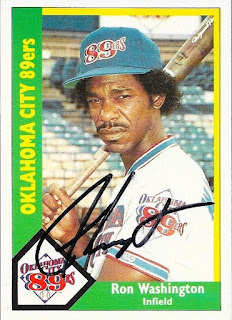 He had 951 hits, 38 home runs and a .263 batting average. 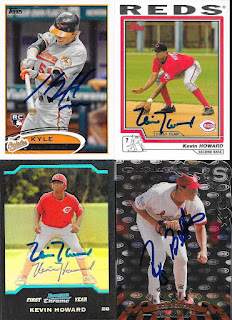 I mailed to Mayne on March 23 and got the cards back on July 28, for a 127-day TAT. He kept three of the cards I sent. I've said several times how I am way behind on posts. This card was picked up while I was visiting card shops with Andrew back in May. The shop where I found this one had two older guys sitting behind a counter talking baseball; just the way I want to spend my retirement. We enjoyed our chat with the guys, so I felt compelled to buy something from them, even though there wasn't a lot to their shop. 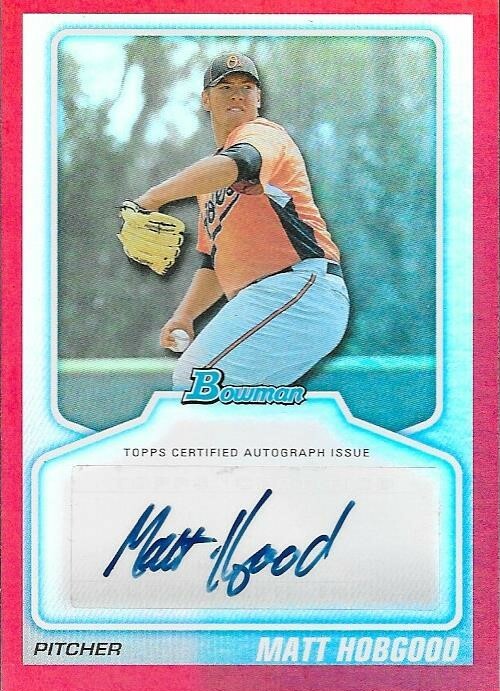 When I saw this red 2010 Bowman Matt Hobgood auto, I had to pick it up. 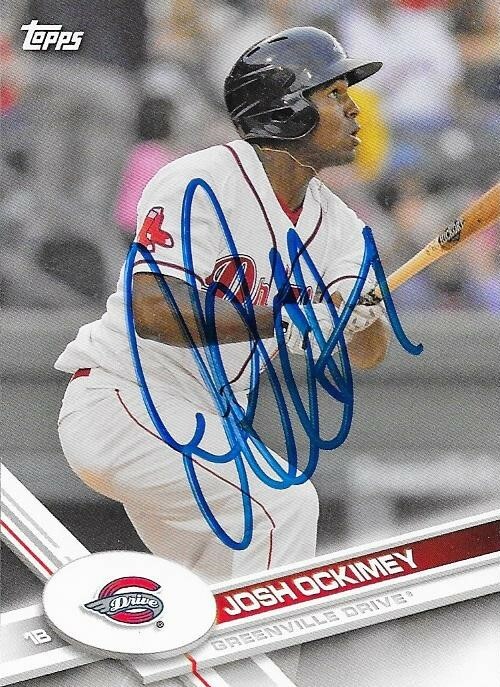 The card is numbered 1/50. I hadn't added anything to the Hobgood PC in a long time. He was a bust as far as 4th overall picks go, but every time I talked with him, he was super nice. Just a really good kid who was plagued by shoulder issues. I really wish he could have taken off as a prospect, but it just wasn't meant to be. This is probably why I'm not a scout. I would have too much of an emotional investment in a player based on their personality; I would have a hard time telling them that their time is done as a prospect. Oh well. From everything that I have seen, Matt is enjoying life and is doing well. That's all that really matter in the end, anyway, right? Here are some more recent cards that I was able to get signed TTM by David Bell. The above 2000 Chrome looks much better in person, but these cards don't scan all that well. Still, I like the card, and am glad I was able to get it back signed. 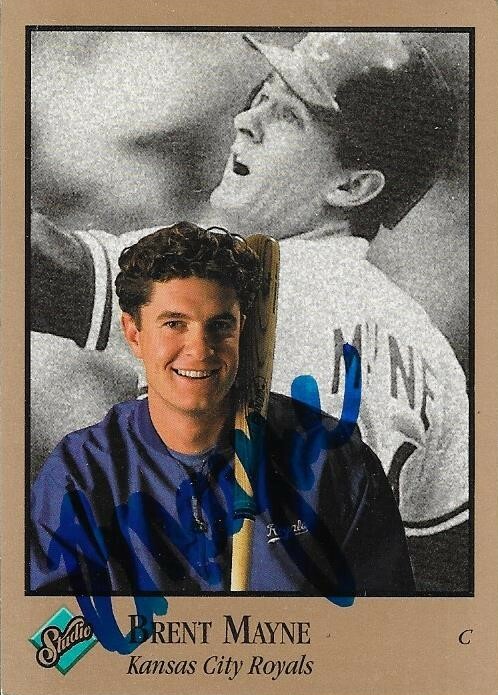 I was happier to see this 1996 Topps come in, though. I didn't have many of these at all, and it shows when you look at my ledger of Topps cards that I have signed. 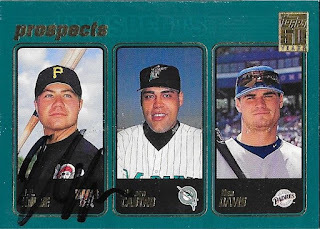 I need to find some bulk 1996 Topps and try to add a few to the album. In the meantime, I will be glad that this one is here. Bell (b. 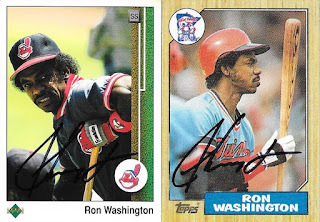 1972) played in the majors from 1995 to 2006 for the Indians, Cardinals, Mariners, Giants, Phillies and Brewers. He had 1,239 hits, 123 home runs and a .257 batting average. 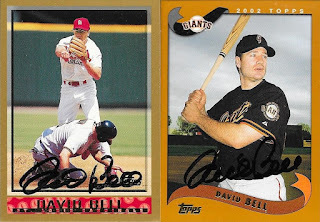 I mailed to Bell on April 4 and got the cards back on July 29, for a 116-day TAT. Four-game series are tough for graphing. It has been tough just having the energy to get done what I need to get done, then get home and prepare for the next game. 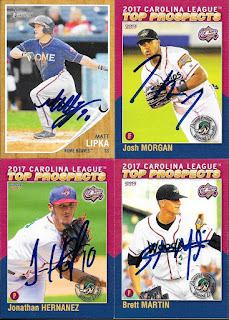 I took on several 50/50s for this series between the Mudcats and Wood Ducks, then added on a few cards later on when I realized one of the roving instructors was a former major leaguer, and when I saw that the Wood Ducks finalls had the Carolina League Top Prospects sets in. I went into the series with the hope that I could get everything that I had signed, but a few players were limiting autos, so it was difficult in getting everything done. 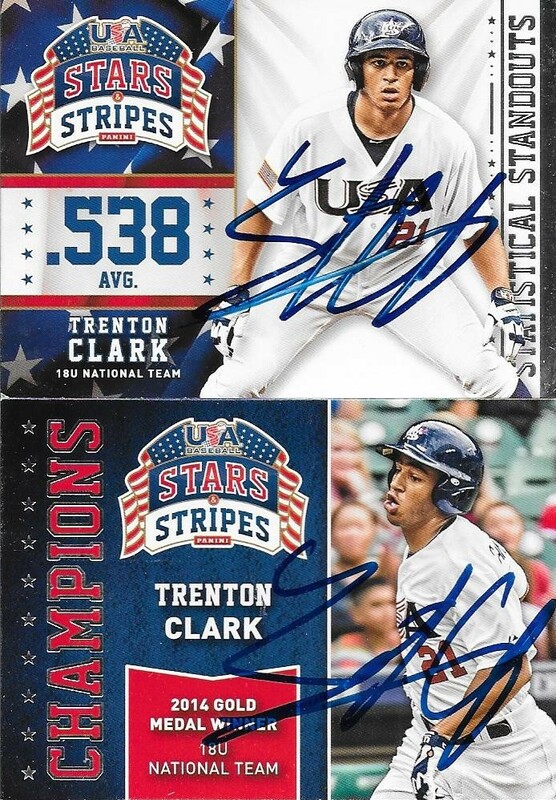 I did get some nice cards from Trent Clark, like the Team USA ones above. 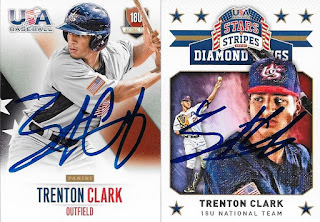 Clark apparently has begun to limit what he signs, so I had to be strategic in what I wanted to get, and when I tried to get it. He was friendly enough, and stopped to talk with Chris and I every game. 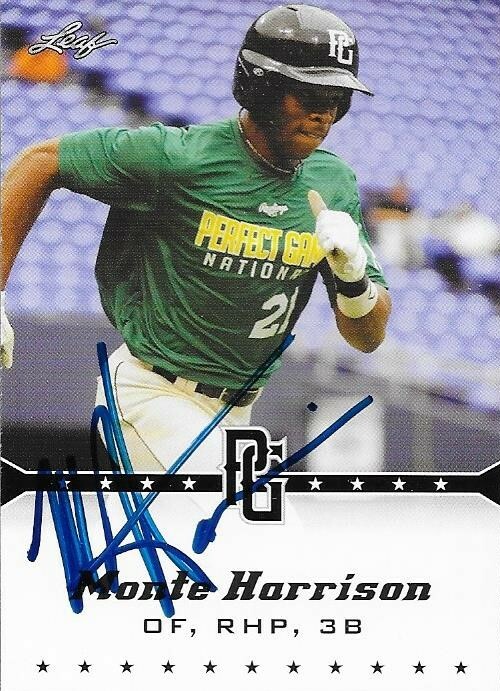 I knew going into the series that Monte Harrison would be a tough sign, and he was. He would only sign one card per person, so by the third game, I was only putting one card in my book that I absolutely wanted. Luckily, I pretty much covered all of the 50/50 commitments that I made. I ended up with some nice ones, though, so I am happy. 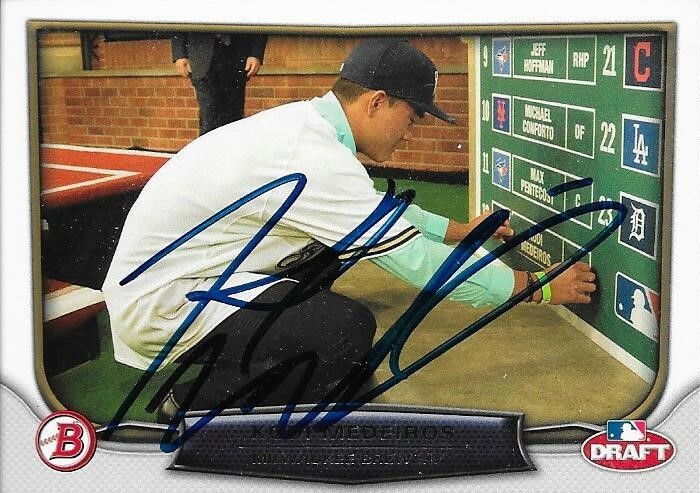 I was especially glad to be able to get this 2013 Perfect Game card signed, since I pulled it out of a pack. Corey Ray was really nice, as always. I had some great cards of him, so I was happy when I completed everything of him by the third day. I even took a card for a friend while I was there and got it signed as well. 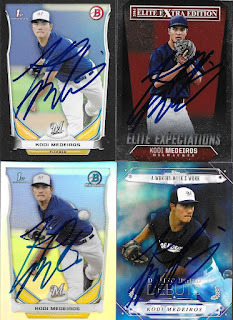 Ray was the only current Mudcat in the prospects set. 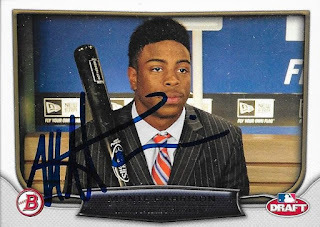 They are nice cards, so I was happy to be able to go ahead and get his out of the way and into my album. 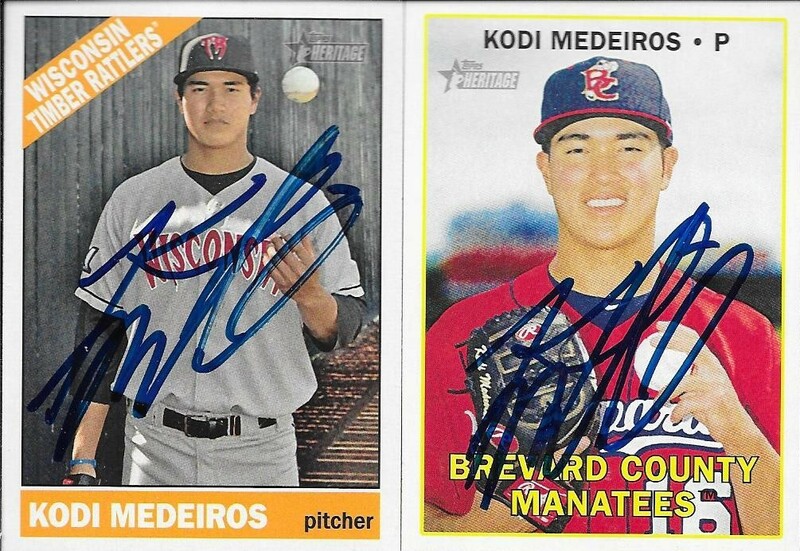 I had a lot of Medeiros cards, and a lot for the 50/50s. 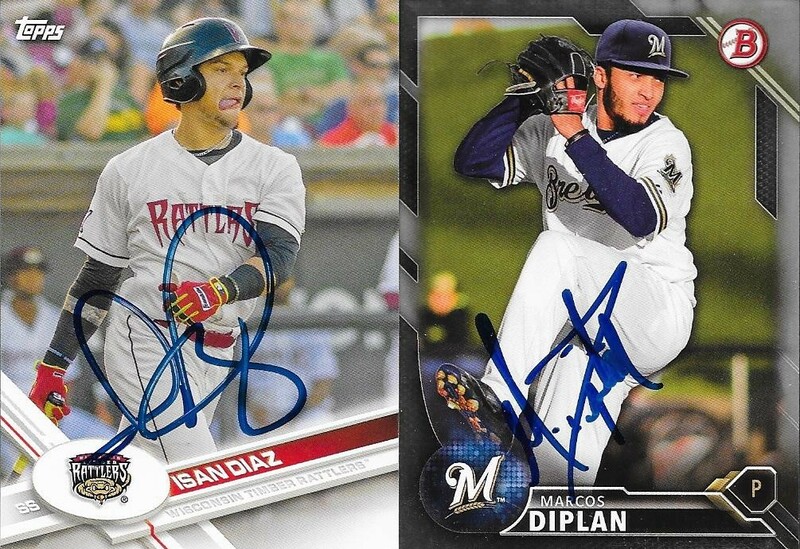 I got all but two of the cards signed. These draft board cards turned out really nice. I ended up with a couple extra, so Chris was glad to get one. He thought they were pretty cool, too. 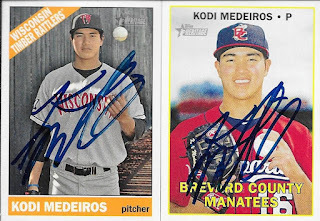 I had gotten Medeiros back earlier in the season, but I couldn't remember what I had gotten, so I just went with what was in my stack. I think I did pretty well. 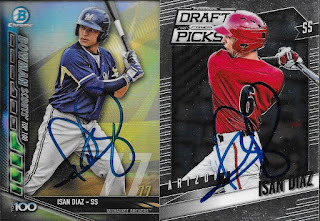 Isan DIaz was on the DL with a wrist injury, but still traveled with the team. 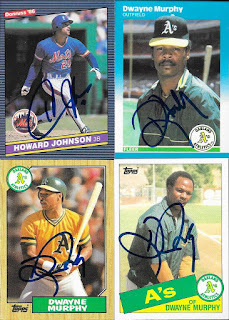 He was one of the few players who (along with Ray) signed everything on our pages. I had a lot of different stuff of Diaz, and I also was able to chat with him a bit while he was signing each game. 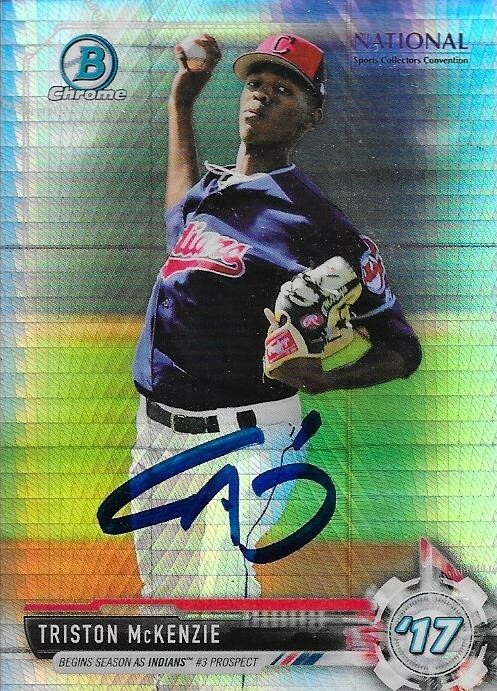 I found the black parallel Bowman of Marcos Diplan at the card shop right before the series started. 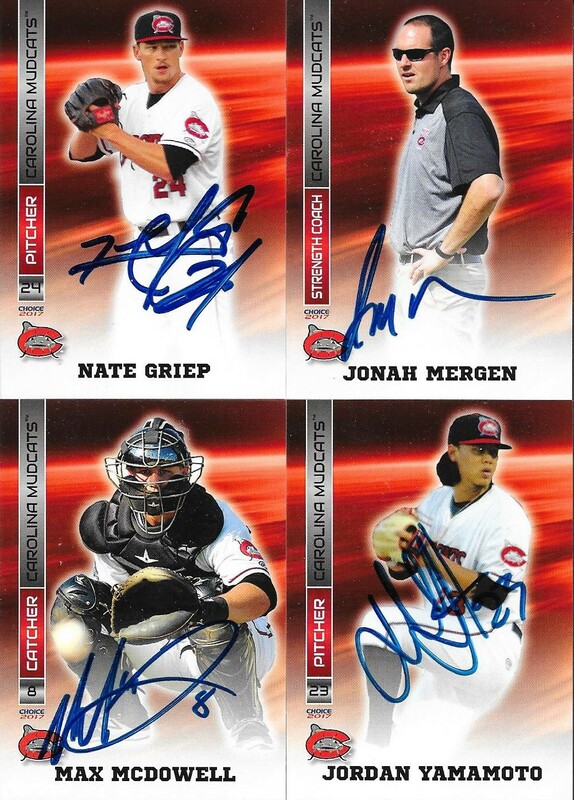 I thought I had more of his cards, but that was it, with the exception of the Mudcats team set I had picked up on July 4th. 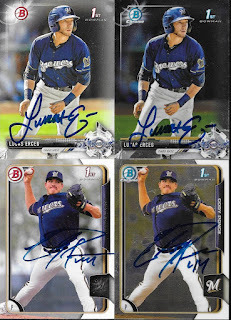 Both Lucas Erceg and Cody Ponce were really nice. They stopped and talked to us each game, whether we had anything for them to sign or not. Trey Supak was really quiet, but friendly. 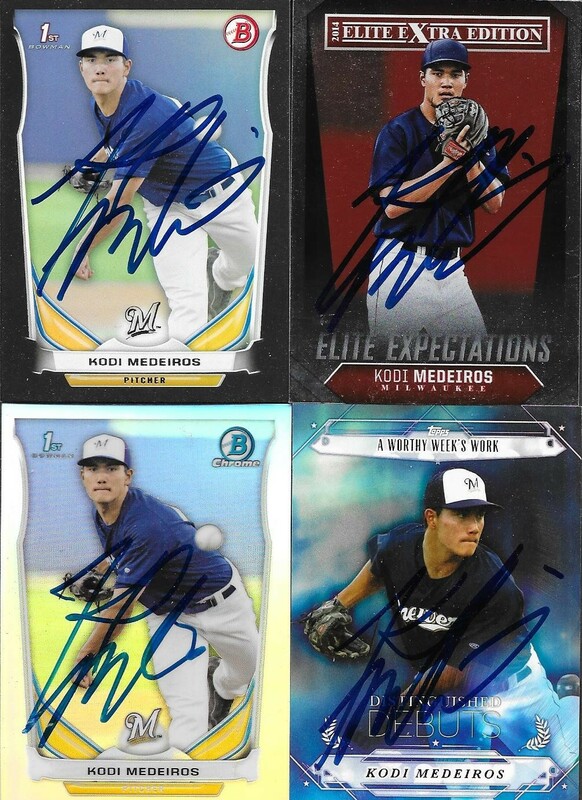 He signed everything we had on our pages, and the cards turned out really nice. I was also glad that the Heritage Minors got signed, since I pulled it from a pack the Sunday before the series started. 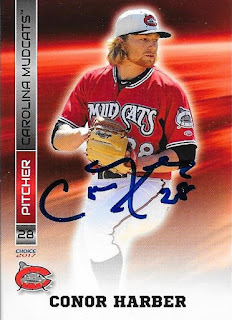 Speaking of my Mudcats team set, I knocked out a ton of the cards during this series. Chris also got the same ones from his set signed. We even were able to get most of the trainers and coaches, which can be tough. The cards are super glossy, but they all turned out really well. I think I got my money's worth out of the set. Speaking of sets, I got my first Wood Ducks cards! These are the only three in existence right now, since Brett Martin, Josh Morgan and Jonathan Hernandez are the only ones listed in the 2017 Carolina League Top Prospects set. I think I was at the game where Hernandez is pitching. I wish the Wood Ducks would have came out with sets this year, but for some dumb reason, they aren't. 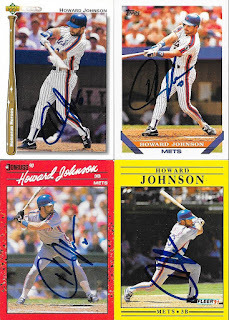 I missed out on HoJo quite a bit during this series, but finally got him the last two games. 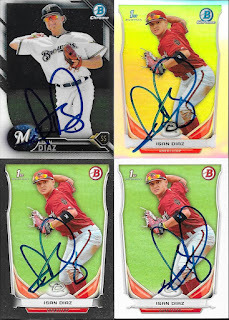 I have most of his cards signed now, so it is all really just taking care of 50/50s for him. Finally, I learned that Dwaye Murphy is a roving instructor for the Rangers, and he was with the team this week. 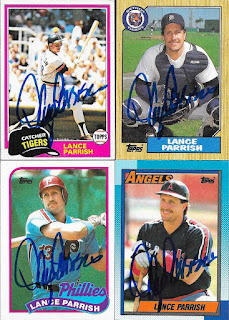 Chris and I were able to get him on three cards, including a 1987 Topps. 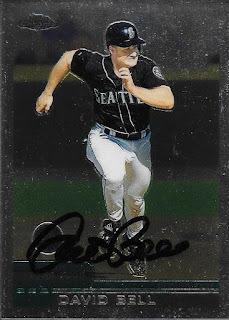 I really like the colors on that one, and it adds to my Topps Project. I have one more series that I am for sure taking in, Lynchburg next weekend. I have no idea how I am going to be able to stand the offseason, but I likely will be spending it reloading and relaxing in anticipation of the 2018 minor league season.